Each October we hold our board meeting at the school in Bondurant. Board meetings are about conducting the business of the district, but I really enjoy the trip to Bondurant. The students there prepare an entertaining presentation for the Board each year and they never fail to impress. This year was no exception. Llamas eating pajamas, fleas drinking iced tea, and sheep driving Jeeps! I guess you had to be there. But this year’s trip held an added surprise. 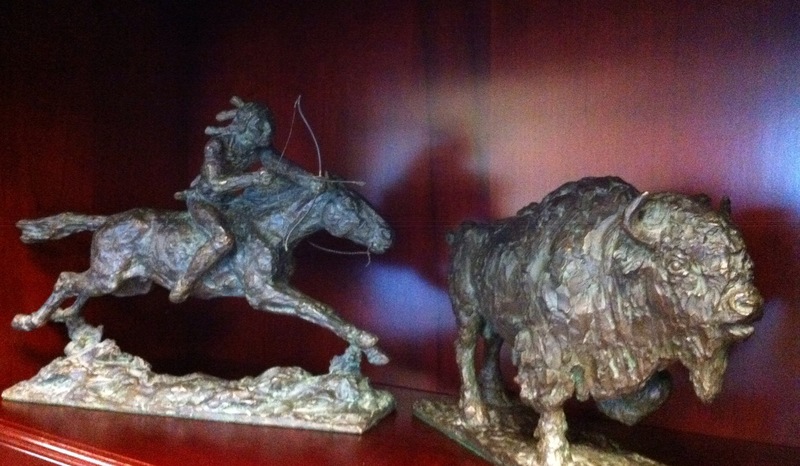 Pat Burroughs presented two beautiful bronze sculptures to the Board and the Bondurant School on behalf of Alice Brown. Alice and her husband Steve came to the Upper Hoback Valley in Bondurant in the 1970’s. They purchased land from a friend and built a home there, quickly becoming part of the community and making many friends. The Brown’s did not have children, but adopted the Bondurant School and the children that attended there as their own. Steve died suddenly in 1986. Alice chose to stay in Bondurant and the school and the children there continued to be a big part of her life. Alice passed away in 2009 at the age of 95. During the last couple of years of her life she mention to Ms. Burroughs many times that the sculptures were for the Bondurant School and its children to enjoy. Alice’s legacy continues through a charitable trust that contributes to many community activities. Memories can be pretty short sometimes. It is our hope that the bronze sculptures donated by Mrs. Brown will serve as a reminder of the value of community involvement. The District is currently working to design and build a display for the bronze sculptures donated by Mrs. Brown at the Bondurant School. Thank you Alice. Thanks Jay for getting that information out there. We will be proud to display these works of art in memory of Mrs. Brown. To honor the gifts of service is in and of itself a gift and a service. This blog page is worth while reading and so very informative. It is wonderful to read of community heros such as the Brown’s. Thanks for the time you have invested in this communication blog.